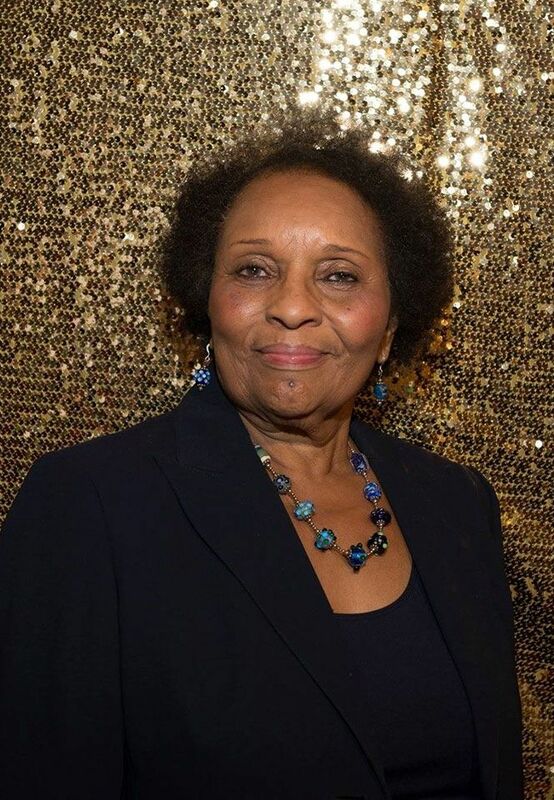 She worked for the Connecticut Commission on Human Rights and Opportunities (CHRO) for twenty-two years. She currently serves as Vice Chair of the City of Norwich Ellis Walter Ruley Committee and on the City of Norwich Sachem Fund and Norwich Disabilities Committees. In 2017, she received the Willard M. McRae Community Diversity Award and a Writer’s Block Ink Humanitarian ACE Award. Please join us as Taftville Fire Chief, Tim Jencks, intertwines the history of the area with his own personal experiences growing up in Taftville. 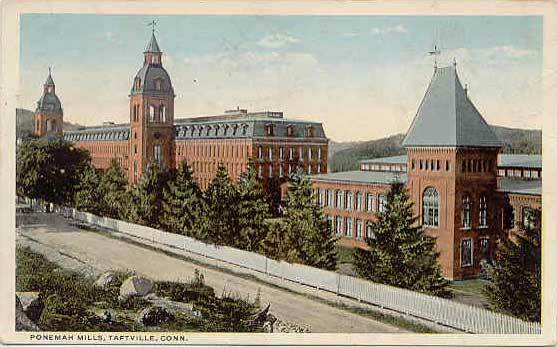 Additionally, we will be premiering the documentary NHS created on the history of Taftville and the Ponemah Mills for our members. Special thanks to former NHS Secretary, Dianne Brown, and the Browning family for their contribution and help on this project. 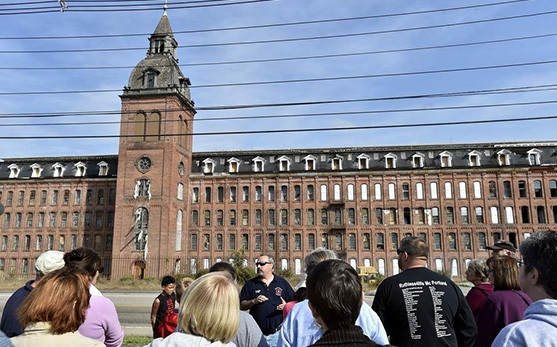 Following the documentary, please join us for a special guided tour of the immaculately restored Ponemah Mills while hearing plans for Phase 2. All guests MUST park at the back of the building. Handicap parking violations will be strictly enforced through the Norwich Police Department. The proper entrance to the Community Room is via the back entrance of the building. Thank you to The Lofts at Ponemah Mills and Taftville Fire Co.#2 for all their help coordinating and supporting this event. 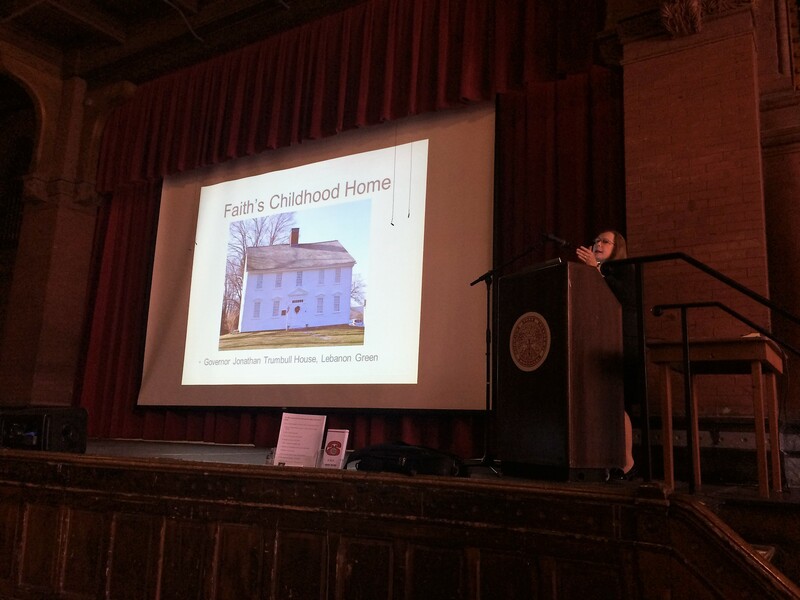 Our 2017 Annual Meeting departed from our traditional style of program and featured three speakers discussing the influence of mental health on Norwich’s history. Faith Trumbull was related to some remarkable historical figures: her father, Jonathan Trumbull, was Connecticut’s Revolutionary War Governor, her husband, Jedediah Huntington, was a prominent General in the Revolutionary War and her brother, John Trumbull, depicted famous scenes from the Revolutionary War in his paintings. Faith was an artist and produced a number of exquisite needlework, yet she experienced severe bouts of depression which sadly caused her to take her own life. Dr. Pamela Hall gave a brief history of Faith’s tragic story while deconstructing the stigma of suicide then and now. Further, Dr. Hall broadly explored how people in the eighteenth century experiencing depression and bipolar disorder managed their symptoms. Dr. Hall is a Licensed Clinical Psychologist and has a deep interest in colonial history. Charlotte Perkins Gilman was a pronounced feminist, social reformist and author. Her most famous work is her semi-autobiographical short story “The Yellow Wallpaper,” which she wrote after a severe bout of postpartum psychosis. 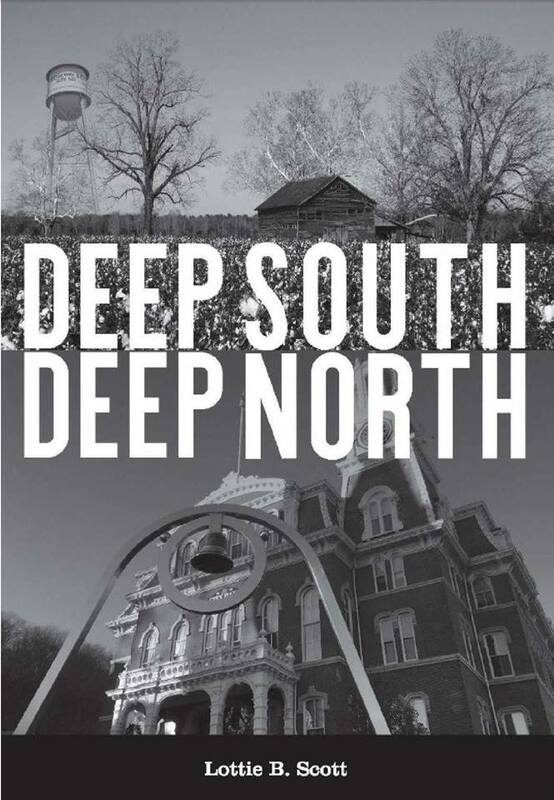 Madelyn Bell is a Junior at the Norwich Free Academy and she interned at the Norwich Heritage & Regional Visitors’ Center during the summer of 2016. 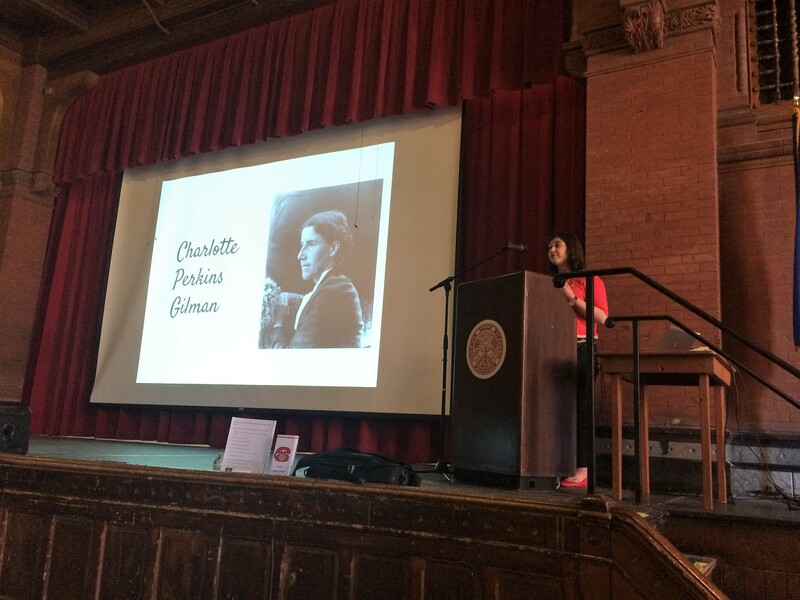 During her internship, Madelyn wrote an article about notable women such as Lydia Huntley Sigourney and Charlotte Perkins Gilman who lived in the Lathrop Manor. Madelyn presented her research on Charlotte Perkins Gilman. The Norwich State Hospital opened in 1904 and remained in operation until 1996. The Hospital was a mental health facility initially created for the “mentally ill and the criminally insane”, but also housed geriatric and tuberculosis patients. 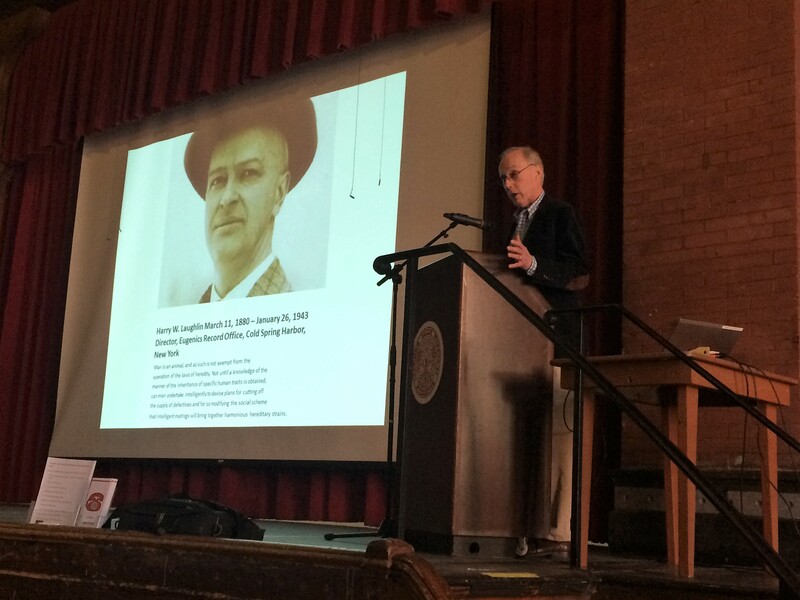 Bob Farwell, the Executive Director of Otis Library, gave a brief history of the Norwich State Hospital and provide dan overview of Connecticut’s involvement in eugenics at the turn of the 20th century. The 2016 program featured Damien Cregeau, who is an independent historian, public speaker and narrator who earned his bachelor’s in history from Hillsdale College and his master’s in history from Colorado State University. Mr. Cregeau is a native of Connecticut, taught history at prepatory schools for several years, and has spoken on various topics related to colonial America and the Revolutionary War since 2007 throughout the northeast. His most popular talks are about spies in the Revolutionary War as well as the life a common foot soldier in that war. There is a resurgence of interest in spies in the American Revolution thanks largely to the success of the AMC TV series “TURN” as well as Brian Kilmeade’s book Secret Six. 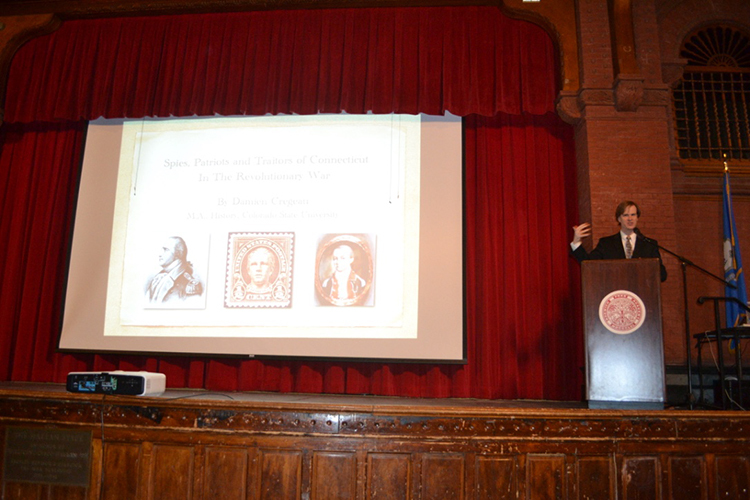 Mr. Cregeau will speak about spies and spy tradecraft in Connecticut and New York during the American Revolution, including those spies and special operations that were tied to patriots and traitors from southeastern Connecticut. Part of the PowerPoint slideshow presentation will include an analysis of patriot leaders from Norwich, including Col. John Durkee, Generals Jabez and Jedediah Huntington, Lt. Colonel Ebenezer Huntington, and the infamous patriot hero turned traitor, Benedict Arnold. 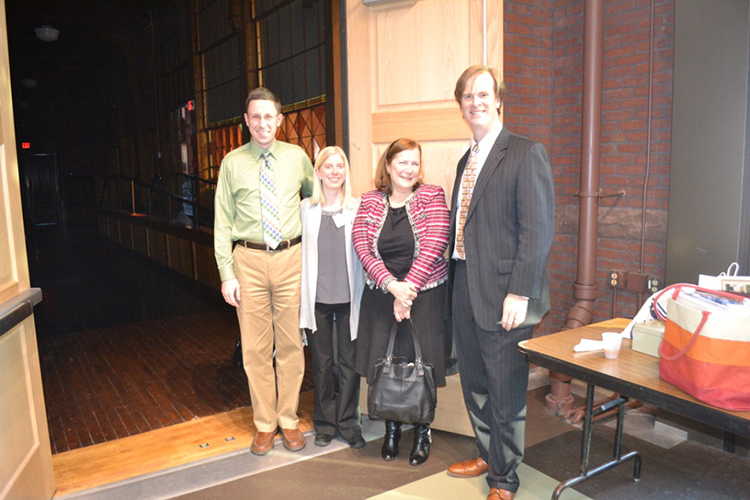 This program featured author Mark Allen Baker, a former business executive and entrepreneur. As the author of eighteen books—including the award-nominated Title Town USA: Boxing in Upstate New York, Basketball History in Syracuse: Hoops Roots and Spies of Revolutionary Connecticut: From Benedict Arnold to Nathan Hale—and a historian, his expertise has been referenced in numerous periodicals, including USA TODAY, Sports Illustrated and Money. 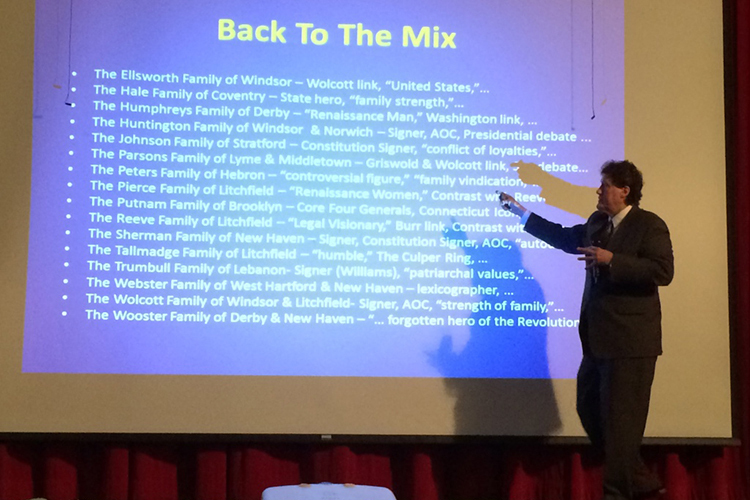 Mr. Baker’s latest book, Connecticut Families of the Revolution, discusses the role men, women and families played during the Revolution. Mr. Baker details the vital role of women during the Revolution and highlights siblings who fought besides each other during the war. Mr. Baker gives the reader insight into what life was like for Connecticut families during the American Revolution. 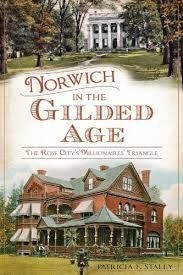 Stroll down Norwich’s most fashionable mile of millionaires’ mansions and mingle with the extraordinary people who lived and played behind their elegant façades during the glamorous Gilded Age. Wealthy manufacturers and merchants constructed magnificent mansions, many of which survive today, along this trendiest triangle in the glitzy Rose of New England. Tricia Staley has uncovered forgotten scandals like the Blackstone baby kidnapping and the bank cashiers who embezzled thousands of dollars from wealthy residents, as well as the drama of fortunes made and lost. Meet Tiffany’s founding partner John Young, rubber shoe manufacturing king William A. Buckingham, the Slaters, Greenes, Hubbards and more salacious, stylish titans of industry and extravagance.